Dedicated to enhancing the local food industry and access to healthy, local food in Oklahoma. The Oklahoma Farm and Food Alliance is a non-profit organization dedicated to enhancing the local food industry and accessibility to healthy, locally produced foods in Oklahoma through continuing education, project management, and sound policy development. Our membership includes local family farmers and ranchers, farmers markets, food production enterprises, food distributors and processors, restaurants and chefs, public health organizations, institutional purchasers, educational institutions, and tribal, local, and state governments. From the panhandle of Oklahoma to the strawberry fields of the Cherokee Nation, our diverse membership represents every component of the local food industry (production, distribution, processing, wholesale, retail), but the majority of food producers are family farmers and ranchers. Through strategic partnerships, community engagement, and sound research, the Oklahoma Farm and Food Alliance strives to build an effective, sustainable local food industry in Oklahoma, while providing better quality food produced in Oklahoma to people from all backgrounds and socio-economic situations. Our goal is to assist Oklahomans engaged in each aspect of the local food industry. Working with both new and established members of the local food industry, we offer trainings and continuing education regarding food production, marketing, business development, and financing opportunities. To this end, we are committed to educating the public regarding the benefits and availability of locally produced foods, in addition to, promoting sound public policies at the local, state, federal and tribal levels. Our ultimate goal is the development of a robust local food economy in Oklahoma offering plentiful jobs, community resilience and healthy living. Building a robust local food system requires extensive consumer and producer training, education, resource development, and policy advocacy. With the support of diverse stakeholders, our membership, and grant-making entities, the Alliance strives to provide training and education opportunities across the state to producers, consumers and institutional purchasers; maintain effective marketing materials for the local food industry, raising consumer awareness of local food availability; assisting with local food infrastructure and equipment procurement through grant-writing and network development; and conducting critical primary research on the local food industry, instrumental to sound local food policy development. The Alliance staff routinely consults with local governmental entities, tribal interests, local farmers and ranchers, and health based organizations regarding local food systems and approaches. As the local food industry grows in Oklahoma, many farmers, ranchers and entrepreneurs request assistance with crop planning, sales models, contracting, and regulatory compliance. The Alliance regularly has coordinated and presented at the annual Oklahoma Food Security Summit, Horticulture Industry Show, Good Agricultural Practices (GAP) on-farm trainings and certifications, Food Safety Modernization Act compliance, aquaponics and hoophouse production demonstrations, and farmers market food preparation and handling seminars. Alliance staff routinely partner with local farmers and chefs to train institutional kitchen staffs at schools how to prepare and procure locally grown food, including knife skills trainings, recipe preparation, and model procurement policies. Our members receive free admission to all trainings and new events are listed on our calendar. Expanding awareness of local foods and market opportunities for local food producers is a top priority for the Alliance. 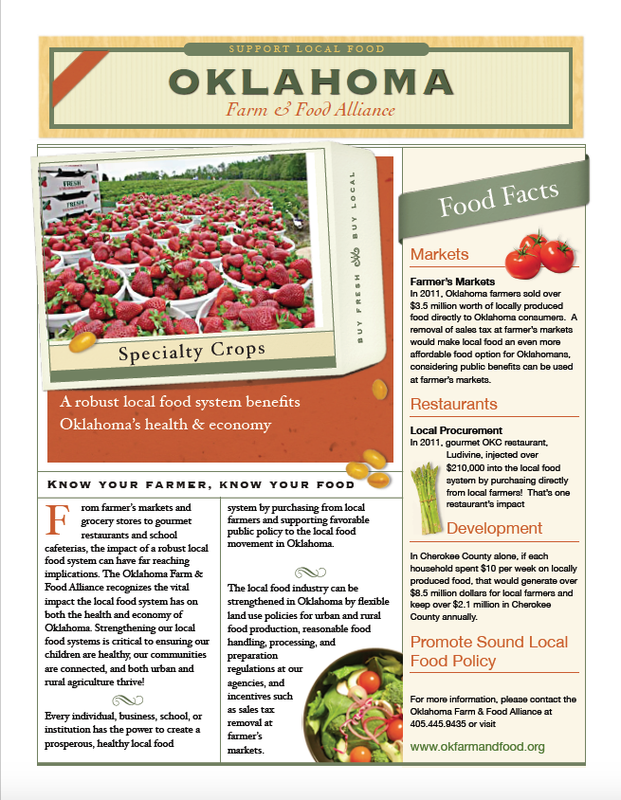 The Central Oklahoma and Tulsa Local Food Guide serve as a comprehensive marketing tool for Oklahoma farmers, ranchers, farmers markets, and restaurants utilizing local food. Through Alliance efforts, the Governor of Oklahoma proclaimed Local Food Week every year in June, when Alliance staff spearheads local food promotional and educational events throughout the state. 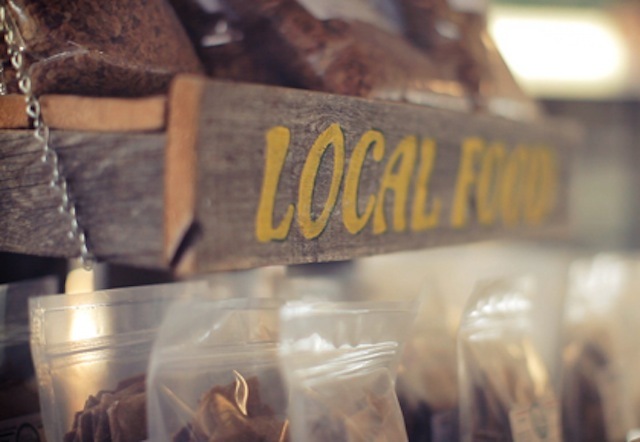 More importantly, through its vast database of local food producers gathered over the years, the Alliance serves as a conduit for producers and end-use purchasers to connect, providing contractual and logistical support to its members. Through its partnerships with the Cherokee Nation and the Oklahoma Tobacco Settlement Endowment Trust, the Alliance has conducted extensive research on food system analytics, developing Food System Assessment Toolkits and community-specific assessments. This data has been instrumental to the Alliance's Food Policy Council consulting and Food Policy Council Toolkit. Utilizing research driven data, the Alliance and its members have worked with local, state, and federal elected officials and agency personnel to develop sound local food policies. Said policies include consulting with the City of Oklahoma City on its updated urban farming ordinance, local food procurement policies for school districts, sales tax exemptions for direct purchase of local foods, healthy cornerstone financing initiatives, and local food provisions in the most recent US Farm Bill.